A comprehensive list of configuration files to jump start your code. Don't forget to take a look at Config, the easiest way to manage your application configuration across all your servers and environments. Looking for a way to validate a certain configuration file? We have compiled a list of configuration validation commands of popular software. We hope you find the list useful. If you know of a software or command that's not in our list, please let us know so we can add it. 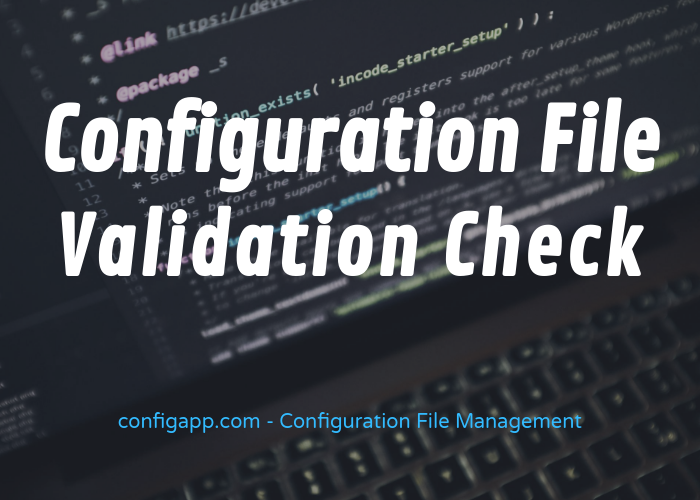 If you are looking for a way to manage your configuration files, please check out Config. ansible-playbook --check will not make any changes on remote systems. Any module instrumented to support "check mode" will report what changes they would have made rather than making them. configtest runs a configuration file syntax test. It parses the configuration files and either reports Syntax Ok or detailed information about the particular syntax error. named-checkconf checks the syntax, but not the semantics, of a named configuration file. named-checkzone checks the syntax and integrity of a zone file. The online tool validates the Ignition and coreos-cloudinit configs used with CoreOS Container Linux servers. cupsd -f -t runs cupsd in the foreground and tests the configuration file for syntax errors. dhcpd -t will test the configuration file for correct syntax, but will not attempt to perform any network operations. dhcpd -T can be used to test the lease database file in a similar way. docker-compose config validates the Docker Compose file. exim -bV checks that the configuration file is syntactically valid. fluentd --dry-run checks the Fluentd configuration without plugins start. haproxy -c checks the config file and exits with code 0 if no error was found, or exits with code 1 if a syntax error was found. python -m json.tool provides a simple command line interface to validate and pretty-print JSON objects. ksvalidator verifies the syntax of a kickstart file, a text file that contains configuration information for a Red Hat Enterprise Linux installation. lighttpd -t tests the configuration file for syntax errors and exits. monit -t run the syntax check for the control file. mysqld --help --verbose checks the MySQL configuration. nagios -v verifies the information in the configuration files. Nagios will not start monitoring any hosts. nginx -t checks the configuration file for correct syntax and tries to open files referred in configuration. gixy is a NGINX configuration static analyzer. ntpd -n runs Configtest mode. It only checks the configuration file for validity. slapd -Tt tests whether the configuration file is correct or not. php -i shows PHP information. postfix check warns about bad directory/file ownership or permissions, and creates missing directories. pg_ctl reload sends the postgres process a SIGHUP signal, causing it to reread its configuration files (postgresql.conf, pg_hba.conf). Validation errors will prevent the config from being reloaded, and errors will be logged into the Postgres log file. puppet parser validate validates the syntax of one or more Puppet manifests. It validates the Puppet DSL syntax without compiling a catalog or syncing any resources. rsyslogd -N 1 checks the configuration file for correctness. This option is meant to verify a config file. testparm is a simple test program to check an smbd configuration file for internal correctness. splunk cmd btool check checks for typos in stanza and setting names. This is the same conf checker that runs on splunk start. squid -k parse verifies the squid.conf file is valid. sshd -t is test mode. Only checks the validity of the configuration file and sanity of the keys. sshd -T is extended test mode. Checks the validity of the configuration file, outputs the effective configuration to stdout and then exits. syslogd -d turns on debug mode, and writes much debug information on the current tty. syslog-ng -s verifies the syslog-ng configuration file is syntactically correct and exits. tcpdchk examines your tcp wrapper configuration and reports all potential and real problems it can find. terraform validate validates the syntax of the terraform files. Terraform performs a syntax check on all the terraform files in the directory. travis lint validates a .travis.yml reduces common build errors such as invalid YAML, missing language keys and unsupported runtime versions. varnishd -C compiles the vlc file and if there's a problem, displays a compiler error. vsftpd olisten=NO starts vsftpd and runs the configuration check, without listening on the network. xmllint --schema validates an XML file against an XML schema. xmllink is part of libxml. Xorg -config tests manually created Xorg configuration files. yaml.rb module provides a Ruby interface for data serialization in YAML format. ruby -e "require 'yaml'; puts YAML.load_file('./data.yaml')"
We will update the page as we learn of more commands. If you know of any configuration validation commands from popular software that we missed, please add them to the comments below.